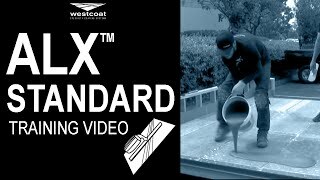 Experience unmatched strength, durability, and design with ALX, Westcoat’s waterproof deck coating system. Formulated for plywood surfaces, the ALX system integrates the finest acrylic resins and cement blends into a reinforced, galvanized metal lath. ALX eliminates plywood seams and is ideal for use in heavy traffic areas. ALX Pro calls for an added fiberlath reinforced membrane. ALX Interior option provides a solution for transforming a wood subfloor to a decorative concrete or epoxy finish. ALX Under Tile system provides a blank slate for installing tile as it waterproofs your exterior deck over living space. 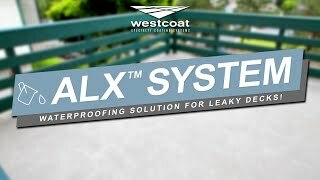 Westcoat ALX Standard is a waterproof walking deck system. It is reinforced with metal lath and is installed with a series of three separate polymer-modified cementitious applications, and sealed with Westcoat’s SC-10 Acrylic Topcoat. The finished product weighs approximately 2½ lbs per square foot. This system gives plywood the look and feel of concrete with a decorative appeal. We have used Westcoat materials for 7 years. The quality and technical support is second to none. The team at Westcoat does more than provide a quality solution, though. They are true partners who are as committed to our success as they are to their own. Surfacing Solutions Inc. has used Westcoat Specialty Products for more than 15 years, they are one of the few companies that products have shown us sustainability in our industry We utilize this company not only for our belief in the products but because of the support we receive from the people of Westcoat. From our Technical rep Marc Di Zinno to the entire inside sales staff and it is not rare to get personal attention from the owner Paul, as well. One of SSI’s core values are “Relationships” so we are appreciative of the relationship we have with Westcoat and their Team. BBH has been applying the Westcoat systems for the past 14 years & cannot say enough about its durability, applicator friendly products, and wide range of finishes, creative marketing & one of the best service support teams I've ever worked with. You never feel like you are on your own when facing challenges in the field. After working with Westcoat for several years, you realize that it's a privilege to be part of a great culture aside from the product lines. Using the WestCoat family of coating products has allowed me to one-stop-shop all of my coating projects needs from Cementitous to Waterproofing to Epoxies. With WestCoat I secured my largest cementitous coating project ever and their support goes far beyond just answering questions. My representative answers the phone after hours and across time zones and is always at the ready to lend support to me. He helps prior to the sale with trainings through the sale and application with site visits and post sale with follow ups and warranty documentation. Couldn't be more happy satisfied as a coating contractor/estimator. Our company has been a distributor of Westcoat products for over 14 years now. Westcoat products are of the highest quality and are reliably consistent, which means a lot to our applicators. Westcoat does extensive in house testing on their products so when there are application questions they have the answers. Westcoat’s commitment to quality and a positive application experience has made them a pleasure to do business with these many years. READY TO GET YOUR JOB GOING? IS THIS NOT THE RIGHT SYSTEM FOR YOUR JOB?